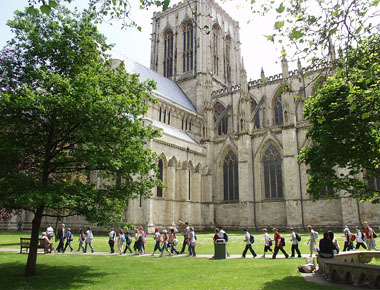 "YORK, CITY OF THE YEAR"
York has medieval origins and within the city walls visitors can take a trip back through history as they wander the quaint cobbled streets and specialist shops. An ideal way to explore the city is to take a boat trip on the river Ouse. The skyline of York is dominated by it's famous Minster Cathedral which is the largest medieval Gothic cathedral north of the Alps. There are unrivalled views from the tower. The recently refurbished Jorvik Centre takes visitors on a journey through time, back to the 10thC and the Viking age city of York.